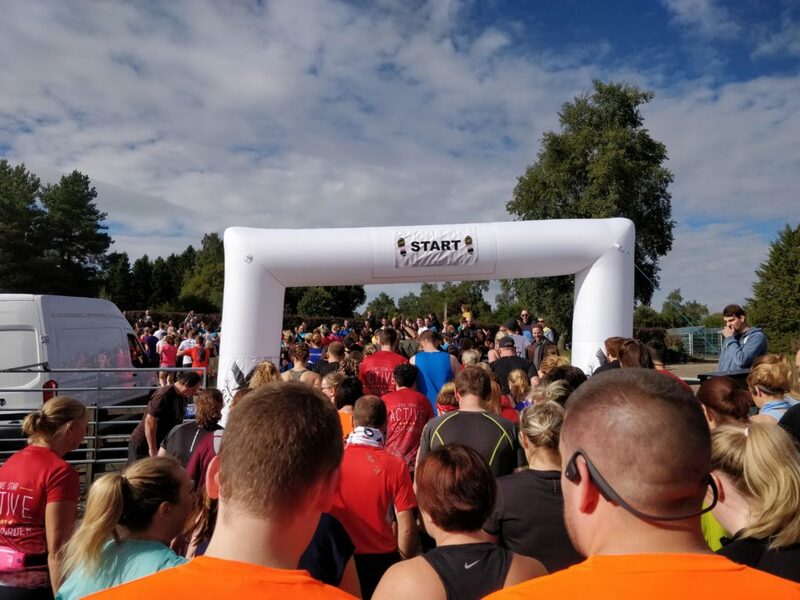 For 2018 the Auchterarder Running Festival was bigger than ever. Two races across two days sounded like a good idea to the organisers. Well, after a few gins (Botanist, I think) it also sounded like a good idea to us !! 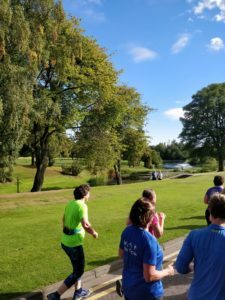 Our build up to the event, with various aches, pains and other associated embuggerances meant we were both approaching the weekend with a certain degree of trepidation. You know the feeling, one of those “lets just get round” runs. Hell you get the same medal whether you’re 4th or last. The drive up from Edinburgh to posh Perthshire didn’t do anything to lift the mood. The drought in the UK is well and truly over. It wasn’t Islay wet, but it looked pretty miserable most of the way up the road. One highlight was re-confirming that yes, Yetts o’ Muckhart is a real place. Luckily the weather improved as we got closer to Gleneagles, otherwise this review would probably have turned into another weather blog. As we got closer to the Gleneagles Equestrian centre where the race stuff happened we did feel slightly to of place in a big yellow camper. More a Range Rover and Jaguar kind of place. We did have a quick look at the clothes shop there too. This seemed to be full of runners picking things up, looking at the price and quickly putting them down again. Registration done, we headed out to the start while everyone else engaged in a weird ritual. Apparently it’s called a “mass warm up” but it looked far too much like hard work for us. We’d need our energy for the actual running thing that was happening. Out at the start we took up the customary GinRunners position towards the back of the field. The strains of a wee piper dude rang out as we got ready for the off. This WAS going to be fun !!! So we kept telling ourselves. The hooter hooted and we were off. Heading up a slight hill before we turned down past the golf clubhouse. Here we got a few odd looks from the golfing fraternity. Maybe they’d never seen so many interlopers on their turf. The long downhill towards the main gate let us get into our stride before we left the estate and set out on a ramble round the village. It’s all too easy to focus on the square foot of road in front of you, but this was a stunning setting well worth a proper look. The trees, the lake with the fountains, what a perfect place for a run. I imagine it’s not bad for a game of golf either. We left the golf course and continued downhill for the first K or so. The sun was shining, the runners were chatting and the locals had come out in force to lend their support. 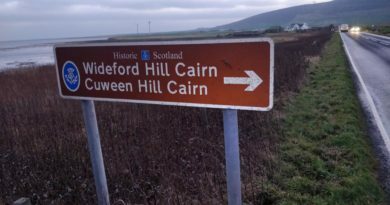 Every wee while there was group of well-wishers, although it was still a bit early for the “not far to go now” shouts. This was much more fun than we were expecting !! And, of course, we had to make sure we hi-fived all the little folk along the way. By this point we were kind of starting to wonder where all this downhill was taking us. What goes down must come up after all. We kept the pace slow and steady as we ran past some amazing houses. We were starting to wonder if Auchterarder had any normal houses. It turned out it did, and as we headed down quiet residential streets the level of support only got bigger. 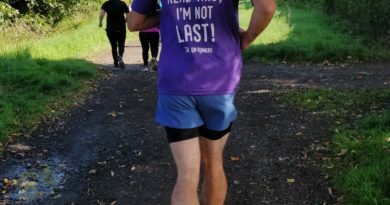 And there had been some amount of effort made there, “good luck” and “keep going” signs were in evidence, but a definite hats off to this young lady who’d gone the extra mile. Who doesn’t need a power up after 5K ?? The water station marked the half way point in the run and we were both trotting along quite happily. Unfortunately it also marked the start of the payback for all that downhill we’d been enjoying. The next couple of K were mostly on footpaths and mostly uphill but we took it easy as we weren’t in any particular hurry. The paths through the trees were very pretty, and the scenery does kind of take your mind off the fact that the legs are starting to grumble. And we’re nearly done… surely. Yep, we’d reached the bottom and now the only way was up. The route home was payback for the long straight “down” we’d enjoyed on the way out… It was the same road in the opposite direction. We certainly plodded back up the hill slightly more slowly than we’d gone down it half an hour before. At least we knew it wasn’t that far to go now. 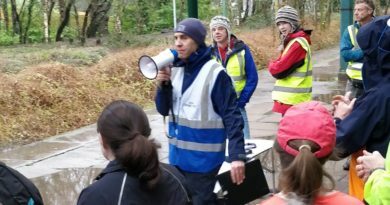 As we made it to the top of the hill and back into the Gleneagles equestrian place there was a short but very welcome downhill bit to the finish. At least if there were any photographers about we’d look like we were running. God were we glad to see the finish though !! We closed the line together and collected our just rewards. Now we’ve come to expect disappointment when it comes to post-race swag but there was none of that here. The disappointment, not the swag. 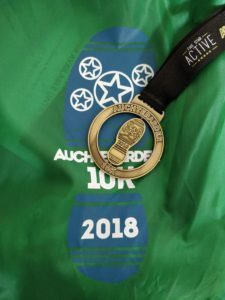 You do get used to things like generic t-shirts and *cough* less than impressive *cough* medals but the prizes at Auchterarder were brilliant. The T-Shirts have a real quality feel to them and they’re properly event specific. The 10K one was a nice bright green colour with minimal pointless advertising and maximum bragging rights. The medals were also ticked all of the requisite boxes. Event name, race distance and year. As we collected Mabel and headed back for Edinburgh there were big GinRunner grins all round. 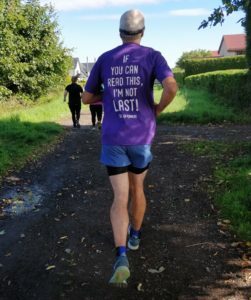 One of us may have only been running for 6 months, but even in Bex’s 8-years of running events it was hard to think of a better run, better supported and more enjoyable one than this. OK, there was still the small matter of a Half Marathon the next day, but for now we tried not to think about that and just enjoyed the drive home. You know what, no wonder this thing sells out so quickly. 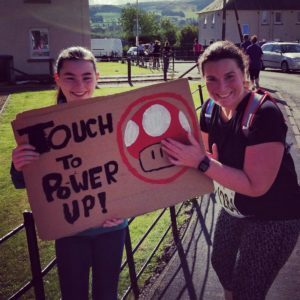 The Auchterarder Running Festival is a bloomin’ gem.